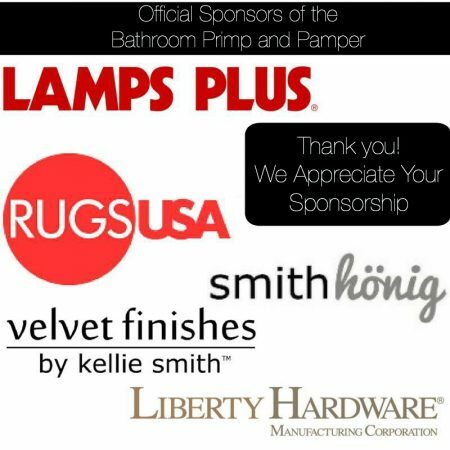 We are getting close to the end of the Primp and Pamper Bathroom Refresh blog hop, and things around here are getting beau-ti-FUL!! If you are dropping by from Street Flea Style, welcome back! 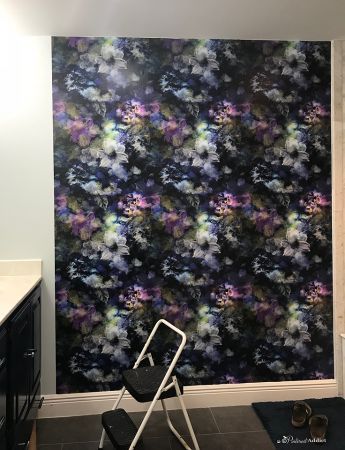 Can you believe how amazing that wallpaper is? Her bathroom is going to be stunning! We got the mirror off the wall, in small pieces, but without killing or hurting anyone. Shout out to my husband and our friend for taking one for the team and getting it done. I can do many things, but flying shards of glass isn’t one of them. Of course, it was glued to the wall, which meant some spackling needed to happen. 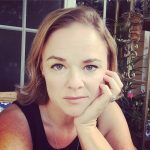 Fun fact: every time I type the word “spackle” in instagram, it autocorrects to either “sparkle” or “speckle” – and I miss it every time. I put the Bryony Strom Noir wallpaper up, by myself, and I have to say for a first attempt, it’s not bad! Only one major oops, which was able to be fixed pretty easy. The fact that the SmithHönig wallpaper is self stick made it pretty easy. It was simple to pull off and reposition if I needed to, and it kept it’s sticking power even when I had to move it a few times. 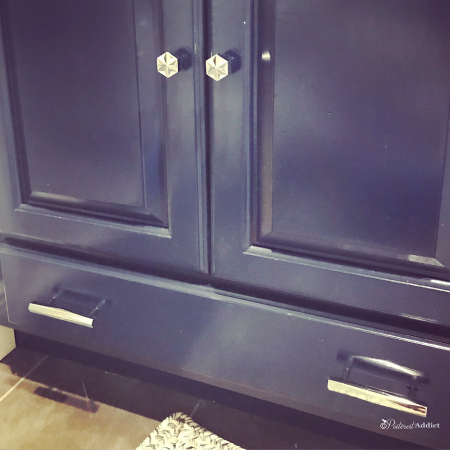 The Liberty Hardware drawer pulls and knobs were installed, and look fabulous. The girls love how “sparkly” they are. I love that they have a little bit of weight to them, both physically and visually. Our Takeo mirrors from LampsPlus arrived – well, one of them did. The other one was damaged in transit and was sent back. Bummer. The one that made it here is fabulous, and I’m praying the other gets here in time for next week’s reveal. It is better in person than the website, and is perfect with the wallpaper! 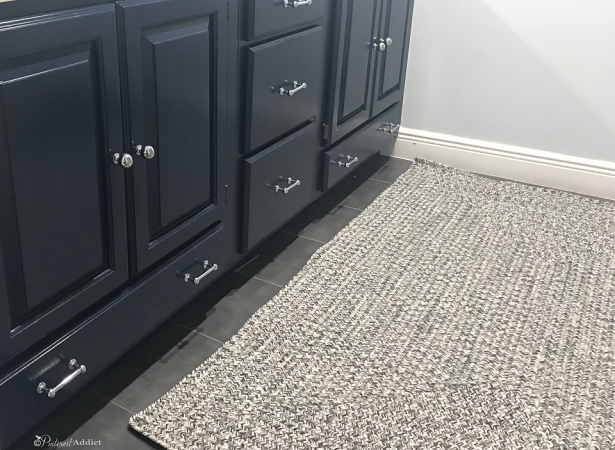 And finally, the rug from RugsUSA is here too – although it is currently “settling” in one of the girl’s rooms while all the activity in the bathroom is happening. The girls have been playing with their Lego’s on it, and say its pretty comfy. I like that it’s nice and thick. 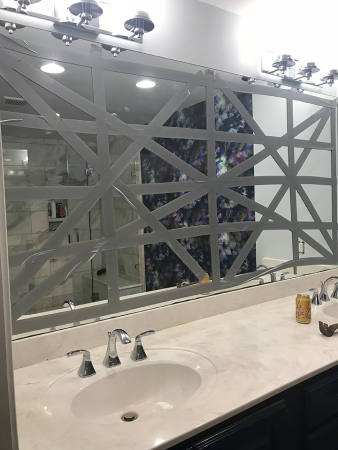 At this point, we still have to put the lights back up above the mirrors, install some of the Moen accessories, hang the mirrors, and give it a good cleaning. 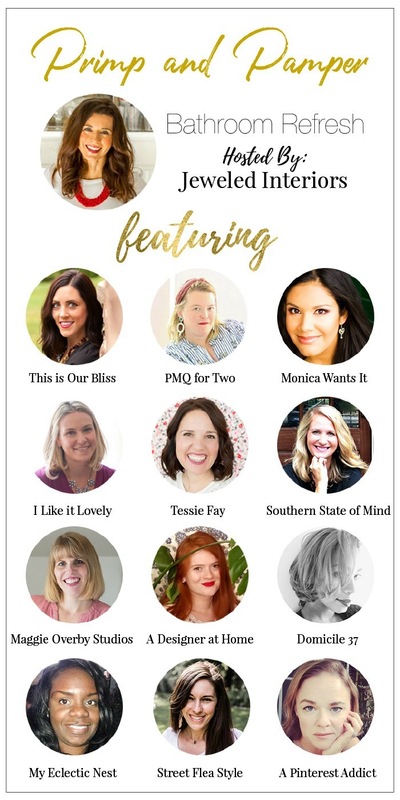 I can not wait to show you the finished room – it’s already so much different than when I started, doesn’t even feel like the same place! Don’t forget to come back next Tuesday to see all the refreshed bathrooms! OHHH, the wallpaper is amazing and the vanity looks so rich. Excited to see them all together next week. I LOVE IT! 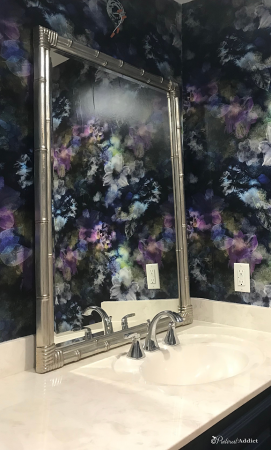 The wallpaper and vanity color are killer! Looking good! I love seeing it all come together! Love the wallpaper!!! Ahhh love how this room is coming together- the wallpaper is stunning! This entire room is just perfect!! I love it and can’t wait to see it all come together. This dark and moody, floral space is GORGEOUS already! Thanks goodness the chore of dealing with shards of glass was not your task! I can’t WAIT to see this next week, Eliesa!! !